I have always had a thing for chicken and dumplings. It's just one of those warm, comforting dishes that satisfies like no other. And, I adore pot pie! This recipe is a collision of the two. 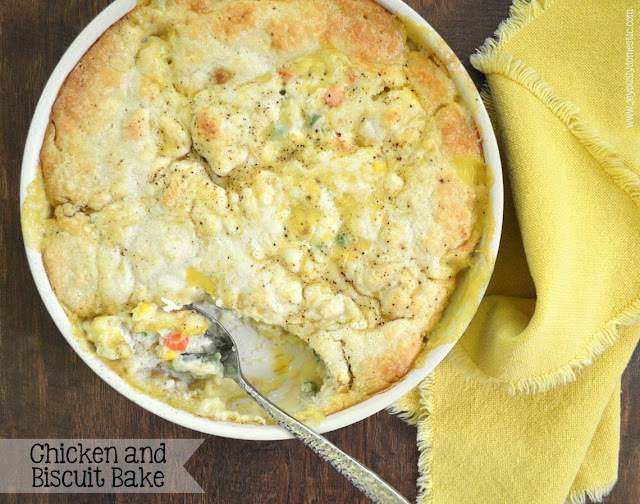 This Chicken and Biscuit Bake is, basically, a cross between chicken and dumplings and a pot pie. In any case, it's fabulously good and comes together in a convenient casserole! It might not be the prettiest dish to photograph, but this has become a favorite with my own family and something that I love to serve throughout the cooler months of the year when comfort food is what everyone is craving. Warm chicken stock in a small sauce pan and add in the bouillon cube to dissolve. Keep warm until ready to use. Lightly coat with non-stick spray a 9 x 13 casserole dish or a 12" round casserole dish. Pour in the melted butter. Layer the shredded chicken on top of the butter. Sprinkle on the vegetables. Set aside. Pour over the chicken and vegetables. DO NOT MIX! Sprinkle on some black pepper. Set aside. Combine the cream of chicken soup with the warmed stock. Once blended, slowly pour over the Bisquick layer. Again, DO NOT MIX! If using a 9 x 13 pan, bake for 40 - 45 minutes or until casserole is set and top is lightly browned. If using a large, round dish, bake for 50 - 55 minutes or until casserole is set and lightly browned. Remove from oven and allow to rest for 5 minutes. Serve. Recipe adapted from Deep Dish South and The Shady Porch. I'm not sure that canned biscuits would work. The Bisquick in this recipe is kind of needed ... as it is what forms together as it bakes with the other ingredients to form the casserole. It may work ... I'm just not sure. Sorry I can't be of more help. I tried it with canned biscuits. The flavor was awesome, but it was more soupy and less formed. Tasted way better than it looked. We're a family of five and I think we have just a little leftover when we have this. So, I would venture to say that it would serve maybe 6 - 8 people ... depending on how large of portions people are served (or take) and if you have other dishes being served with it. :) Hope that helps. Making this tonight for the first time! look yummy! This looks soooo delicious! Can't wait to try this tomorrow night! This looks so delicious! I am looking for recipes that I can make ahead & put in the freezer...do you know if this would freeze well? I still don't see the temp to bake. Could you let us know in your reply? Thanks this looks so easy and sooo delicious. My family should devour this one. I made this and it was delicious but way tooooooo salty that I had to throw the rest away. Could it have been the bouillon cubes? I updated the recipe to reflect that I use low sodium stock. I didn't have that info provided originally, so I apologize that yours was too salty. Also, I had another reader email that her attempt turned out a little too salty, as well, so I updated the recipe to encourage readers to start by adding 2 cubes of bouillon and to only add the third if they think it is needed. Thank you for your feedback. Why use chicken broth and bouillon cubes? It is just a preference thing, but you could omit the cube if you so desired. It just fortifies the flavor in my opinion. This is really good!!! It would be really great with cheese! I used all 3 bouillon cubes and was glad I did. YUM!!! It looked exactly like the pictures and it was a hit with my husband too!!! Thanks!! Love hearing that a recipe here on Joyously Domestic was a big hit! So glad you guys loved it! Thanks for stopping by! The ones that I use for this recipe are the small cubes that are about the size of dice. Hope that helps. :) And, hope you enjoy the dish! is this your original recipie that you made up? sounds good? I adapted the recipe from Deep Dish South and The Shady Porch (both are recipe blogs) ... as credited at the end of my post. I took what I liked about both recipes, played around with it and perfected it into the recipe you find here. :) So, I have to give credit to their blogs ... they inspired me to come up with something my family loves! I made this for supper tonight exactly as the recipe said. It was very good and my hubby loved it. I'm curious though .. it tasted quite salty yet I didn't add any salt and used low sodium chicken stock .. is the salt coming from the boullion cubes? It was easy to make and I will definately make it again. I am glad that you enjoyed the recipe. A few others have mentioned that it can be a little salty ... depending on your stock/broth and potency of the cubes. I would maybe recommended lessening the amount to just 1 cube next time. :) Since others have brought this to my attention, I will update the recipe to read only 1 cube. There is salt in the chicken soup, too, so it probably only needs 1 cube. Also, if people are using salted butter, that will up the salt content, too. I usually purchase unsalted, but didn't think that many use salted. Thank you! do we absolutely need the boullion cubes? I do not have any........could anything else be subbed in ?? Hello, what exactly do you mean by bisquick? I really want to make this. It looks so delicious. I see bisquick pancake boxes and bottles all the time. A bit more info will be quite appreciated. Thanks Angela. Your description and the pictures made me want to make this dish right away so I went ahead and made it with the bisquick substitute using APF, Baking powder, salt and oil. I am so happy I made it and I simply loved it. My stomach was full but my heart was not satisfied and wanted one more serving. I over ate. I really did. I loved it. Thanks again. Posting as me this time instead of being Anonymous. Hi, do you think this could be put together in the morning, then put in the fridge to be taken out and baked in the evening? I think I would take it out of the fridge 30 minutes before baking to let it get closer to room temperature then bake according to directions. Going to try it tonight. Sounds delicious! You could make up the first half of this recipe (chicken and veggies) and put it in the fridge in the morning (or even overnight) and then when you are ready to pop it in the oven at the end of the day, quickly mix up the Bisquick and milk combo and then the chicken stock and chicken soup combo. I don't think it would turn out as well if it sat completed in the fridge all day? But, hey, that's just me! lol I haven't had this yet, but, it is in the oven at this moment and smells very nice. I used a can of Cream of Chicken with Herbs and no bouillion cubes. Blind baked 4 deep dish pie crusts, made my own filling but then topped them with your top crust idea...after it came out I brushed it with melted (seasoned) butter...it was FABULOUS! 2 of the 4 pies are already gone...lol! Thanks for this GREAT idea/recipe!!! This is sooo good!!! I followed your recipe exactly. It was easy to make, smelled wonderful while baking and tasted heavenly. One of my new favorites. Thank you! excellent recipe the whole family loved it !!! I cooked this for my family last week and it was a huge hit. There was enough to feed my family and have some leftovers. We already decided we will use the leftover turkey from the holidays with this recipe. Already looking forward to the leftover turkey with this easy recipe. Planning to make this tonight and I'm just wondering how the dough turns out. Is it much like a biscuit or more doughy because of the soup/broth mixture? Don't see an option to pin this to Pinterest cuz I'm an empty nester and won't make this till my kids come home next time. I made this for dinner tonight and followed the directions to a "T" except I used dark meat versus the chicken breast and I seasoned the chicken with basil and sea salt. It was fabulous!!!! Using the one bouillon cube was key as I didn't need any additional seasoning. This was superb!!!!!! So glad you enjoyed the recipe! :) Thanks for stopping back by to share your experience with it! I've made this twice and it was perfect both times. It looks pretty messy when it goes in the oven, but it comes out great. I will never try another chicken pot pie recipe, this is the one for me! Awesome! I so love it, too! :) Thank you for your feedback! good stuff.. made this today for a halftime treat and everyone loved it..
Our family really enjoyed this quick comfort meal. Keep up the great work and thanks for sharing. Because I can't have MSG in the evening, I deleted the cream of chicken soup and substituted low fat half and half and shredded cheese. It was awesome and more healthy. I'm glad the recipe mentions how pathetic the casserole looks before it goes into the oven. I might have thought I'd made an error in making it. Looks pretty good coming out of the oven and the smell was heavenly. What a wonderful dish for a cold winter evening! Thank you. My name's Marla, I tried this and it's sooo good. I'm gonna try it with beef. Also gonna try it with Broccoli and Cheese. I used three CANS of chicken and it turned out just right!!! Hi! I made this tonight and it was delicious! No more making chicken pot pies; THIS dish will now be my go-to cold weather, comfort food meal!! Just so you know I assembled the dish in the morning and kept it in the fridge until I was ready to cook it at dinner. Worked great!! Just have to cook it like 10 mins longer. I remember having something similar, except it was baked in a bundt pan. I can't remember though if the recipe said to use the pan, or if we just used the pan since it was the only one we had left. just wondering if anyone used 2 cans of soup and made the dumplings as useal and covered the soup with the formed dumplings and cover it while cooking so the dumplings won't brown? What could be used here in England for the bisquik part of the recipe please? Bisquick is a buttermilk baking mix, similar to pancake mix. Here is a recipe for a similar mix I found online. Your could cut it down. In a large bowl, sift together all dry ingredients. Blend well. With a pastry blender, cut in shortening until evenly distributed. Mixture will resemble cornmeal in texture. Put in large airtight container. Label. Store in a cool,dry place. Use within 10 to 12 weeks. Makes about 13 cups of Quick Mix. I have collected I-don't-know-how-many chicken pot pie recipes over the years. Yesterday I found your recipe online and tried it last night without making any changes, except to cut it in half. Just wanted to let you know, all those other recipes I collected? I tossed them in the recycle bin. From now on, I'll only need yours! How fabulous! I always love to hear that people are enjoying the recipes I share here. Thanks for the kind words! Do you think canned mixed vegetables would work? I think it would be fine to use canned veggies. They'll just be a little softer in texture compared to using frozen, but it should work! I hate the taste of canned veggies. Would only use frozen veggies. Maybe use peas instead of mixed veggies. That would make it more English. This is one of the dinners that my husband requests when he gets to choose ahead of time. I use a homemade cream of chicken soup (same consistency and taste as the canned stuff minus MSG) as well as a homemade chicken bullion substitute. We absolutely love it!!! I am stuck at home without a can cream of chicken....is there anything I can do to make it from scratch? I made this today for a potluck at our church. It was so good and so easy. I added 3 potatoes that I diced and parboiled. Hubby and I added a few potatoes, cheese and of course onions! Super excited. Only 45 minutes left. :) Thank you for the idea! Life is good. This is delectable! What can I use instead of bisquick? I don' t know what is that, and we don't have those things here. Can I use mixture of egg, flour, something as sponge for cakes? Love all of your additions ... especially the curry. Thanks so much for leaving your feedback. :) Hopefully, it turns out perfectly for you next time, but I'm sure it was still delicious even with a little extra bake time. Thanks for this. I make it just the way you say and it is awesome for my family on any given night. I like that it's so easy and I add mashed potatoes on the side. It 's a good comfort food and I'm thankful I found it!!!! Don't think it needs more starch with the potatoes. The biscuits would be enough starch for me. I stumbled across this recipe either on Pinterest or Facebook...wow, am I glad I did! It is delicious and so easy! I used turkey instead of chicken since I had a bunch of leftover turkey in the freezer. And I used almond milk since that's all I ever have in the house. This one is a real keeper!! Awesome! So glad it was a hit for you! Thank you for the feedback. I know that you get many, many comments, but I just want to encourage you! I used this recipe many times in the States and all of the people that ate it, loved it! Currently I live in East Africa, and I wanted to make this for my team, forgetting that foods are different here. So I went out on a mission to find all of it, because not following a recipe stresses me out. But I had to branch out, and it turned out just as delicious, now I like to stray from recipes. My team loved it, so I am actually making it again soon which is why I am revisiting this site. I now have found all the ingredients since I have been here longer, so I will probably be doing a mixture! I want to thank you for this recipe, thank you for bringing my team comfort, and thank you for bringing us together. We like to eat together once a week, so your recipe helps with that!!! And you are feeding belly's halfway across the world! Happy, happy day! How awesome. Thank you for taking time to write and for your kind words. You totally brought a smile to my face and made my morning. This IS such a comforting recipe ... and, it is so wonderful that you are able to make it and serve it all the way where you are. Blessings! I made this and it was super salty even with low sodium broth. I will omit the bullion cubes altogether next time. More salt can be added from the shaker if necessary, but we had to throw out the first batch...just too salty. Thanks. Do you make the cream of chicken before you add it to the broth? That is, add a can of water, stir and heat, then add it to the broth? I really like chicken and I'm using Foodsaver Gamesaver Deluxe to preserve chicken. I'm satisfied with the best vacuum sealer which is not only cheap but also has the high quality. Thank for your recipe. I like using buttermilk pancake mix instead of Bisquick. One of the times I went to make this dish, I realized I had no Bisquick. What I had was that pancake mix. Seemed to taste better AND crust better. I come back to this simple, but delicious receipe every time the temps start to drop and the leaves begin to change. My family of 7 adores this dish and we never have leftovers! Thank you so much for sharing this! Chicken and biscuit! Amzing recipe! I think my kids will love it like I do. Thank youf for sharing this! WOW, It look too delicious. I love your chicken and biscuit bake, thanks for sharing this great recipe! I make this often. Sometimes I use just corn for my veg. Another thing is that I like it better when I use buttermilk pancake mix instead of bisquick. I think it slightly sweetens the dough AND it seems to brown a little better on the top. Welcome, Julia! So happy to know that you all loved this! Thanks for your feedback. Didn't work for me. I followed the instructions but it turned out way too doughy in the center. The soup flavoring did taste good but I didn't like the end result. I would make it again only omitting the Bisquick the way it is suggested and instead make biscuits to put on top. As far as others saying it was too salty, I used 1 bouillon and less sodium chicken stock. That part was good.